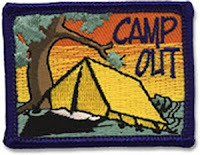 Troop Campout @ Woodstock Island - This Weekend (September 13th-15th). Scouts assemble at the church at 4:00PM Friday afternoon in Class 'A' uniform. Pack for 2 nights camping (warm days/mild nights). We will have dinner at the campsite. Cost is $25.00 per camper.